I don’t know if you guys have heard the devastating news, but as if enough stuff weren’t falling apart, apparently Necco, the company that makes the little chalky Valentine’s Day hearts with the cutesy messages will not be making them this year due to an elaborate business-fail. Figures. So, those of you feeling Valentine’s Day Festive will have to make do with chocolate. Fortunately, we have a few suggestions for you! Oh, and let’s say you’re on a wee bit more of a budget than that-you know, like maybe you’re a writer. Alberfeldy Whiskey brand ambassador Una Green Goldman suggested a nice make-at-home alternative she is calling “Bee Mine.” Here are the details. For the Infused scotch: Infuse the Aberfeldy 12 with cacao nibs overnight. After 24 hours, strain the liquid. For the Honey syrup: To make the honey syrup, mix 2 parts honey to 1 part water then add two large pinches of sea salt to the syrup. For the Cocktail: Combine all ingredients in a cocktail shaker. Shake long and hard, and finely strain. Serve the cocktail in a coupe glass. Meanwhile, if mixing, blending and infusing is just more than you have in you right now, you have my sympathies and also some broad suggestions for Chocolate and the Spirits That Love Them. 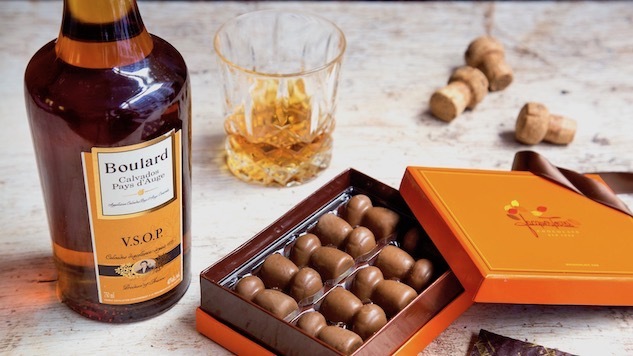 If you are a milk chocolate person, I’d like to point out that, while your foodie friends probably rag on you for your childish palate, you can confidently create grownup drink pairings that are suited to it. One example: Aged rum. I was recently turned on to Diplomatico’s Reserva Exclusiva, which seems to be one of a pretty limited number of non-controversial things currently coming from Venezuela. It is a smooth customer to be sure, with prominent notes of maple, vanilla, licorice, citrus and pineapple. If rum isn’t your bag, port might be! Personal rec: Fonseca’s Siroco white port, a lightly oaky, straw-colored fortified wine with enough acidity to be a foil for milk chocolate and a fruity aromatic profile that favors apricots and peaches. Dark chocolate is admittedly more versatile in some ways, and the good stuff is complex and precious enough to warrant careful pairing. If you like your chocolate with nuts, especially almonds or pecans, I like bourbon (Four Roses is a reasonable draft pick). The echo between the nuts and the cacao and the oaky, nutty, caramel-y notes in the bourbon is just pleasurable. A more offbeat but totally worth-it partner is apple brandy or Calvados (Calvados specifically comes from Normandy and it has a different character than American apple brandies, but they both work). Boulard Calvados will set you back about $50, but brandies are something you sip slowly in small quantities and honestly, if you do the per-drink math, it’s not a huge investment. It’s so nice, too-a bit like the love child of bourbon and tannic apples, with a strong vanilla note on the finish. Valentine’s Day is rougher than the military-industrial-advertising complex would have you believe, guys. If you actually have someone in your life who makes you feel like celebrating romantic love, you have to deal with potentially crippling performance pressure. And if you don’t, you will have your nose rubbed in that fact so relentlessly it will become obvious to you why February is the shortest month of the year. So, like, do what you have to do.